The civil engineering sector is set to receive a much-needed boost with the news that a revised Metro North scheme will form the central part of the Government’s capital spending plan. The original €2.5bn Metro North plan was shelved in 2011 after the new Government came to power. The new scaled back plan is expected to cost €1.8bn. The Irish Times is reporting this morning that Minister for Transport Pascal Donohue was presented with a list of six options by the National Transport Authority last year, including two different Dart links, a Luas from the city centre to Swords, a rapid bus system, the revised metro plan and a combination of a Dart and a Luas line. 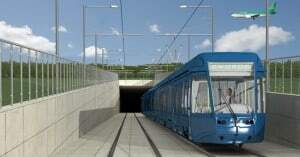 The revised metro plan is now seen as the favoured option. The Government’s capital spending plan was due to be published today but has been postponed until next week. The new metro would follow a similar route to that proposed in the original plan, running from St Stephen’s Green to Swords via Drumcondra, Ballymun and the airport reports The Irish Times.